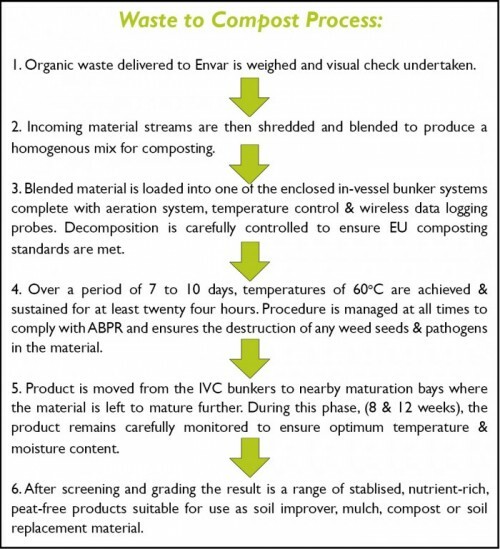 Envar is a bio waste management and recycling company specialising in organic waste and market/product development. Envar has over 30 years experience in composting and work with a number of Local Authorities helping them to achieve key performance indicator targets. Local authorities are faced with recycling and LATS targets to divert organic waste from landfill. Envar works with a number of local authorities and industrial clients to compost waste in a sustainable manner. Envar utilises a double ended batch tunnel in-vessel composting system. The technology partners GiCom are recognised industry leaders. The system is fully enclosed with a biofilter to minimise emissions. The system is ABPR compliant. Envar staff have over 30 years experience in composting. The GiCom system has been developed over a 25 year period.